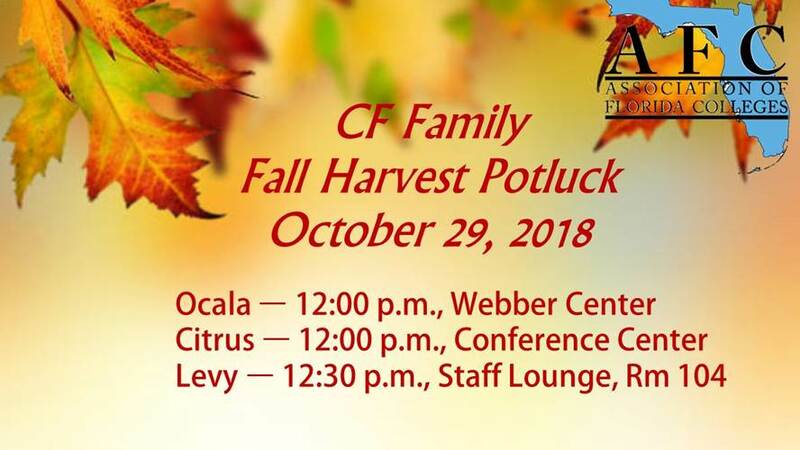 You are invited to CF’s Fall Harvest Potluck on Monday, Oct. 29, is hosted by your CF Chapter of the Association of Florida Colleges. The Ocala Campus will be held at noon in the Webber Center, Citrus Campus at noon in the Learning and Conference Center, and on the Levy Campus at 12:30 p.m. in the Staff Lounge, Room 104. AFC is providing the turkey, gravy, rolls and iced tea (both sweetened and unsweetened). Please help provide the rest. • If your last name begins with A-F, bring dessert. • If your last name begins with G-P, bring a vegetable, fruit or salad. • If your last name begins with R-Z, bring a starchy side. These are just guidelines. If you fall into starchy side, but you really love to bake, consider trading with a coworker. Food storage space is limited. If you are able, keep your food hot in a crockpot in your break area or office until close to lunch time. If you are not bringing hot food, please bring your food in a disposable container. Everyone must also bring a disposable serving utensil (spoon, tongs, etc.). If you do not bring disposable items, you are responsible for retrieving what is yours at the end of the lunch. Not an AFC member yet? Complete an application at our luncheon to be entered into a drawing for a gift card.